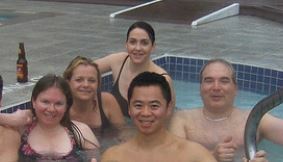 Hot tubs are a great place to unwind, rejuvinate and connect with family and friends! Life can be hectic and unpredictable, but having a warm soothing retreat at home can improve health and attitude to face the challenges. This site seeks to find the best deals on hot tubs, hot tub parts and accessories to allow more people to benefit from hot tub ownership. Buying and owning a hot tub doesn’t have to break the bank. Shopping wisely can save hundreds and even thousands of dollars. Also finding better deals on hot tub accessories and party can keep the party going without high expene or delay. If only I were soaking in my hot tub right now. Work can be stressful, but having a hot tub retreat at home can help rejuvinate mind, body and spirit. HotTubSpaTips benefits from contributions by hot tub enthusiasts.